This is my third trip in the southwest part of the Cebu Province and I headed for Badian. 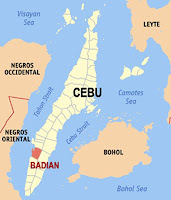 The Municipality of Badian is located 98 kms and 2 hours southwest of Cebu City. It is bounded by the Municipality of Moalboal on the north; Municipality of Alegria on the south. 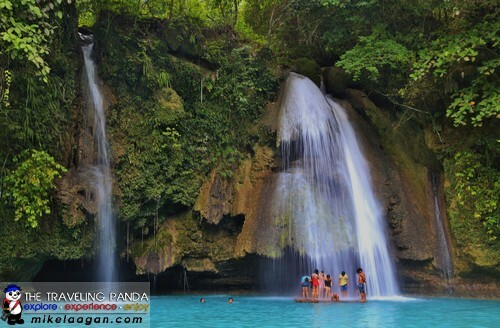 The most common destination in Badian is the Kawasan Falls in Brgy Matutinao, 10km going south from the poblacion. A church on the left side serves as the landmark going to the falls. There is also an available parking area in front of the church since vehicles are not allowed to go inside to conserve the natural beauty of the waterfalls. Some will offer guide when you reach the area but it's not recommended since the 1.5km trail is really easy and just a mere 15 to 30 minutes leisure walk from the national road. The road is actually wide enough for 4-wheel vehicles since there are residents near Kawasan Falls. 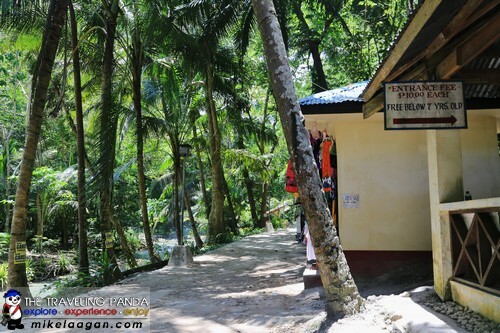 There is an entrance fee of P10 per person above 7 years old, which is is used for the maintenance of the area. There are also souvenir shops offering beads, necklaces and Kawasan print t-shirts along the way. It is advised to bring flashlight or headlamps if one intends to stay late at the falls since the road going back is quite dark. Several establishments that serve food and refreshment can be found near the falls but it is advisable to bring your own food since their prices are not quite cheap, sometimes even double the regular prices. 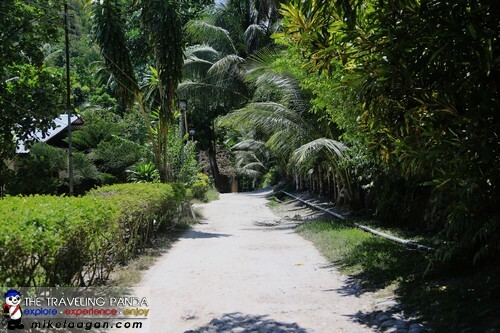 There are also cottages (Php 1,500-2,500) for overnight stay and tables (Php 500) available for rent. One can also rent a raft (Php 300) to take you around the the “pool” or for a refreshing “shower massage” under the falling water. 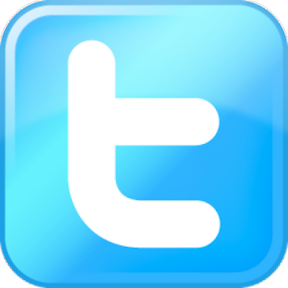 A raft can take at least 10 persons and maximum of 20. Life vests (Php 50) are also available for rent. No need to tip the guy who will pull the raft since Php150 out of the Php300 already goes to them. Kawasan Falls is visited by not only by locals but alkso by foreign tourist who spend their vacation in Cebu due to its accessability. A lot of divers in Moalboal also go here since it only takes less than an hour to reach the Brgy Matutinao in the municipality of Badian. 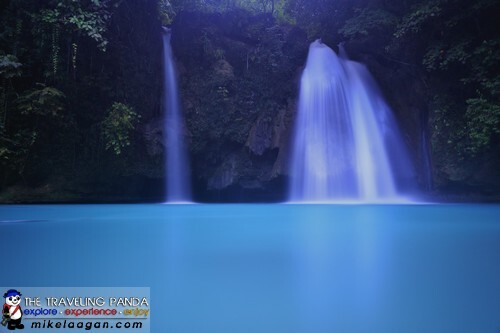 The first level of the Kawasan Falls has a drop around 40 meters high and a wide and very deep catch basin. The second level watefalls is a 15-minute hike from the first level and has a drop of 20 meters and also a deep catch basin. Several cottage are also built near the second level. Some mountaineers who climb the Osmena Peak (the highest peak in the Cebu Province) usually conduct a traverse from the peak going to Matutinao River which passes through Kawasan Falls. Aside from swimming in the waterfalls, there are also options for canyoneering (Php 2,500) for those who are more adventurous. 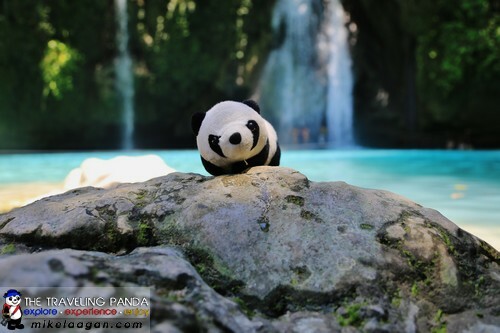 Before I left, Utazo had his picture taken in one of the rocks near the 1st level of the Kawasan Falls. Take the Ceres Bus plying the Bato-Barili route from the South Bus Terminal in Cebu City. It is a 2.5-hour bus ride from Cebu City. The earliest trip is 2AM which is ordinary bus. the first trip for aircon bus is 5AM. Bus leaves every hour, but be there at least 30 minutes before your intended departure because all seats may be taken already by the time the bus leaves. Inform the bus conducttor to drop you off at the jump-off to Kawasan Falls. Last trip back to Cebu City is 7PM from Samboan. From the neigboring island of Negros Oriental, it is a 20-minute fast craft ride from Sibulan to Liloan, Santander or Tampi to Bato, Samboan. 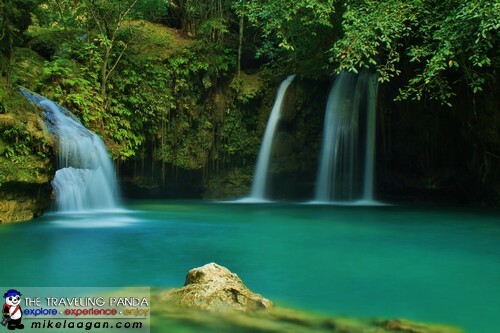 From Liloan, Santander, you can reach Kawasan falls in 1 hour by taking the Ceres Bus going to Cebu City via Bato-Barili. 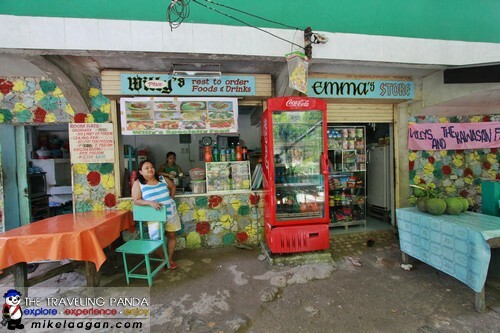 From Bato, Samboan you can reach the jumpoff to Kawasan Falls by bus in approximately 45 minutes. karamihan traverse sa Kawasan Falls from Osmena Peak sir. Oo. Sobrang amaze na amaze ako sa landscape. Iba cia pag malapit sa mga mounds. 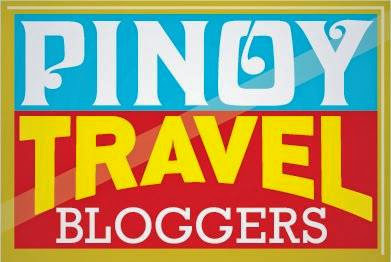 I have a question :) fellow blogger here for the raft is it 300 per person or can we split the 300 with someone else so we just pay 150 each? If we' d go for the canyoneering adventure, do we have to book ahead of time??? 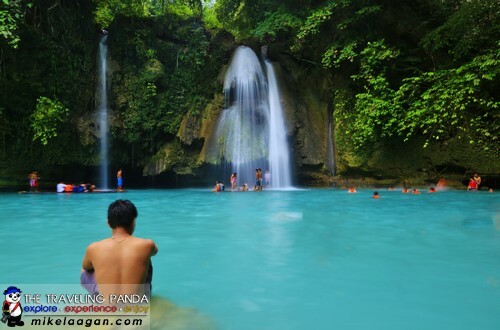 yes, you have to book ahead of time, canyoneering ends at Kawasan Falls. 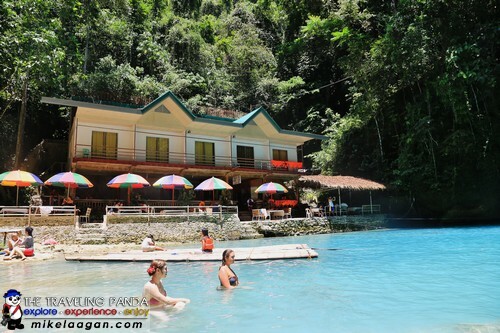 The resorts in Moalboal have several packages for canyoneering, though I have not tried it. Someone may offer you when you are in Kawasan but they are merely third party who will pad the price. 2 years ago the price for canyoneering was Php 2,000. 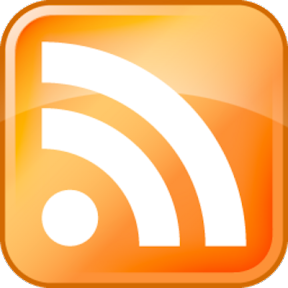 I am not sure how much it cost now after Drew Arellano featured it recently. I think Richard Guttierez also tried this last year in his own show. Do we have to book ahead of time if we' d want to try canyoneering??? Good day, Sir! Paano po bumalik sa Dumaguete from Kawasan Falls? Ano po ang dapat sakyan namin? Thank you. Take the bus going to Samboan. there are ferries there going to negros islanda. i think its going to amlan. from there take the 1 hour bus trip going to dumaguete.